Ares Games has acquired the license to publish the Age of Conan strategy board game. Prepare to drive your enemies before you. Ares Games is proud to announce that a deal has been signed with Conan Properties International LLC to re-launch and expand the "Age of Conan" Strategy Board game. "Conan is a classic property with great stories, and the Hyborian world is a wonderful setting for a board game", commented Roberto Di Meglio, Director of R&D of Ares Games, and one of the game authors. "We think that Age of Conan will be a great addition to Ares' catalog, and we have very exciting plan to develop the game." "We're glad to see a re-launch of this game and that its fans are as excited about this expansion as we are," said Jay Zetterberg of Conan Properties International LLC. The "Age of Conan" strategy board game, based on the popular character and the world created by R.E. Howard, is designed by the same team who created the popular "War of the Ring" board game. In "Age of Conan" up to 4 players take the reins of one of the most powerful Hyborian Kingdoms - Aquilonia, Turan, Stygia and Hyperborea. Using armies, sorcery and intrigue, each Kingdom tries to gain supremacy over the opponents, while Conan - a powerful character striding across the lands and completing countless adventures - can switch his allegiance from one Kingdom to the other, while at the same time progressing in his own path from thief to king. The game was launched in English language in 2009 by Fantasy Flight Games. Since its launch, "Age of Conan" acquired a faithful fan base, clamoring for the game to be expanded. 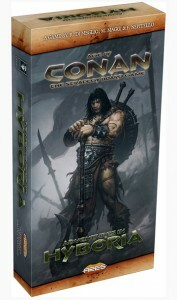 Thanks to an agreement with Fantasy Flight Games, Ares Games acquired all the remaining inventory of the 1st English edition of the game, and will relaunch it by publishing an expansion - "Adventures in Hyboria" - with a strong spotlight on Conan himself, giving a new dimension to his role in the game, and adding new elements to give more character and more flavor to each Kingdom. 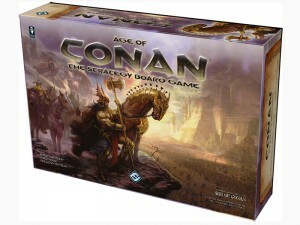 Christoph Cianci, CEO of Ares Games, said: "We are very happy that, thanks to the amicable deal with Fantasy Flight Games, we will be able to offer immediately the current edition of the ‘Age of Conan’ strategy board game to our customers. We look forward to relaunch this great game with the new expansion. The design elements added by ‘Adventures in Hyboria’ make the game even more exciting, giving a new depth to the interaction between players and to the adventuring life of Conan." "Age of Conan - Adventures in Hyboria" will be launched on Kickstarter in October, 2014, and is scheduled for release in Spring 2015.